The upkeep and well-being of the cemetery and closed churchyard in Pateley Bridge are overseen by local volunteers who are members of the Friends Group, established in Spring 2004. Harrogate Borough Council has the responsibility for keeping the cemetery and churchyard safe and tidy and overall responsibility for maintenance and management of both. The Group works in association with them and is insured for small working parties, gardening, sweeping leaves and planting. Many of the memorials had been lowered some years earlier for safety reasons, following an accident in a Harrogate cemetery. But since 2006, as a result of intense lobbying and fundraising by the Friends, three hundred and forty-five monuments, including crosses, headstones, table and chest tombs, railings, kerbs and a listed octagonal memorial have now been restored and reinstated. This is thanks to Pateley Bridge Town Council, Harrogate Borough Council Bereavement Services, North Yorkshire Probation Service, and the Parochial Church Council working in partnership through the agency of the Friends Group. Funding has come from these organisations as well as from North Yorkshire County Council and through the generosity of individual donors. 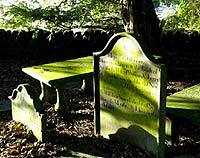 Membership of the Group is open to anyone with an interest in the cemetery and churchyard. Further information is available from the Chair: Dr Joanna Moody, Church Green House, Old Church Lane, Pateley Bridge, HG3 5LZ, Tel. 01423 711508, joannamoody@btinternet.com, the Nidderdale Museum and Nidderdale AONB. Our cemetery is an important record of the social history of our area, and could be said to contain the biography of our community; it thus makes a special contribution to the rich heritage of Pateley Bridge. It is to be found in a wonderful, gently sloping location, with magnificent views over the town to Greenhow and towards upper Nidderdale. Being west-facing, it is especially lovely here at sunset in the summer months. Opened in 1874, the cemetery covers 2.86 acres and is divided into two main areas: (1) the consecrated area dedicated solely to Church of England burials (the area past the fountain up to Old Church Lane) and (2) the un-consecrated ground set aside for other faiths (the area nearest the lodge and chapel up to the fountain). The first interment took place on 16 October 1874, and the cremated remains section was opened on 22 February 1969. The lodge and chapel were sold into private use in 1999. There are over 950 memorials, many of which have been restored since the Friends came together, whilst others have been reinstated by families, with the support of Harrogate Borough Council. The cemetery is visited regularly and there are always flowers, especially at Christmas and Easter. A record of all the memorial inscriptions is in progress, thanks to the hard work of two of our members, and the Friends receive many enquiries which they are now able to answer. To reach the cemetery, follow the Outer Heritage Trail by walking up the High Street, following the road round to the right. Turn left following the Panorama Walk sign. Follow the path uphill and turn into the cemetery at Bishopdale House. 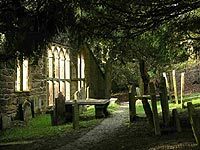 The closed churchyard of St Mary’s can be reached through a gate at the top of the cemetery, where you can then rejoin the Outer Heritage Trail. In memory of Mercey (d.1795, age 3), John (d.1796, age 21), & Ann (d.1797, age 18) Colling. There are 231 memorials in the churchyard, some dating back to the seventeenth century. Two are listed, including one to Mr Purse, an octagonal shaft on an octagonal plinth (2m approx. to SE of chancel) and one to Thomas Green (approx. 2m to W of tower), with an interesting skull and crossbones design. A local mason, William Paley, and some of his family are buried here, as is a former local schoolmaster, William Swires. The Harker family is recognised in a magnificent memorial near the kissing gate into Old Church Lane. All the headstones have some historical interest; many are decorated and there is a range of skilfully carved lettering. The oldest are dated 1684 and 1697 and the oldest grave occupant, Mary Myers, was apparently aged 120 years (SW, near gate to cemetery). There are more than 20 yews, some centuries old, several holly and beech trees, and laurels. Snowdrop and other wild flower planting began in 2004, and ten bird boxes were installed in Spring 2006 by Nidderdale AONB volunteers. The Outer Heritage Trail follows the path around the old church and goes through a kissing gate on the right. Cross a field, keeping the old barn on the right, and look back for views towards the cemetery and churchyard and across and up Nidderdale. There was first mention of a parochial chapel here in 1320, although it is possible there was one earlier. The original building suggests a simple almost square form with small two-light windows except for the east window, which has four lights divided by a transom. 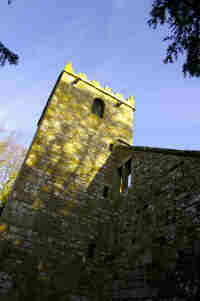 Part of the church was reconstructed in the seventeenth century, and the tower was added in 1691. In 1724 a faculty was granted for a gallery; in fact, there were three galleries and the square blocks of stone standing above the floor level most probably carried pillars to support them. The church began to fall into decay at the start of the nineteenth century and it was closed in 1826 when it became too small for the congregation, too expensive to repair and too inconvenient to reach. A fifteenth century bell from the old church now rests in St. Cuthbert’s, Pateley Bridge. Little is known of the interior fittings but an early oak Bible box is housed in the Nidderdale Museum. A memorial stone inside the church records that, in memory of William Harker of Harefield, his elder daughter Gertrude Elizabeth Illingworth in 1906 had the whole ruin repaired and pointed. Before the existence of the present cemetery with its chapel (now closed) a portion of the nave of St Mary’s was roofed over for the use of burial services. This was known as a chapel within the church, but was demolished in the 1880s. The Friends Group arranges for the tower to be opened to the public for the Heritage Weekend in September. An information leaflet is available. As Muriel Swires states in her book: “The atmosphere surrounding this little plot is calm and peaceful – so let it ever be”. Further information in: Muriel Swires, The Church of St. Mary Pateley Bridge (undated; copies available in St. Cuthbert’s Church, Pateley Bridge, £1.00). And in: Moody, Joanna. St. Mary the Virgin: Church Green: Pateley Bridge. Nidderdale Museum Society, 2015, p/b, 36 pages, 21 x 15 cm, £2.00, ISBN 978-0-9928508-1-4. Copies are available at the Nidderdale Museum, Pateley Bridge.